In Part One of "How to Read Numbers Recaps", we looked the breakdown of the team-based stats. After all, basketball is primarily a team game. However, there is obviously a view of how well individual players contribute to the team's success. We attempt to capture this view through the individual ratings. Below is the basic table that we look at after every game. It may seem busy, because even the walk-ons played, but there is a lot of information contained within this table. For this example, we are going to use the game against Florida Gulf Coast (3/4/08). What do all of these categories mean, anyways? Usage - Usage is the percentage of total possessions that a player consumes. If the game has 67 possessions, how many of those 67 possessions does each player use? Typically, usage shouldn't be any higher than 20-25%. The general idea is that the higher a player's usage, the less efficient they become. It's rare that someone can combine a high usage with a high offensive rating, and these types of players are superstars (like Michael Jordan). Offensive Rating (ORtg) - Offensive Rating is based on several elements. A player's offensive rating revolves around their role in the offense, how important assists are to their efforts, and how well they do at scoring field goals. On a per-game view, Offensive Ratings should always be compared against the team Offensive Efficiency. If the player has a higher score than the team Offensive Efficiency, then they boosted the average. If the player has a lower score than the team, then that player was a drag on the offense. This higher the offensive rating, the better that player did. Individual Points Produced - Consider the following scenario: Dominic James makes an assist to Ousmane Barro, who then scores. The team gets two points, but both DJ and Barro should get some credit for producing the two points. After all, Barro doesn't score unless DJ gets him the assist. How does one divide up the credit for the two points? What about the role of offensive rebounds in producing points? Individual points produced attempts to answer these types of questions. Players who get offensive rebounds or give lots of assists get more credit for producing points. Players who receive lots of assists get docked on producing points. Defensive Rating (DRtg) - Defensive rating is somewhat limited in its capability, and is best used as an approximation. After all, box scores do not presently show any statistics for scenarios where a player is guarded and then misses or makes a shot. Therefore, what is done is to baseline defensive stats off of the team Defensive Efficiency, because the team plays defense. Then, individual player stats are used to adjust individual defensive rating. A player gets credit for defensive statistics like steals, blocks, or defensive rebounds, or they get dinged for committing fouls or not collecting defensive statistics. 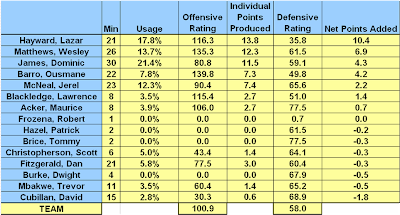 The lower the defensive rating, the larger the impact that player had on the game. Net Points Added - In the Florida Gulf Coast game, Marquette ended up winning by a margin of thirty points. Which players had the greatest impact on that win margin? The answer is found in Net Points Added. In every Individual numbers recap, the players are sorted based on net points added from highest to lowest. If a player is positive net points, that player had a positive impact on the game. If a player is negative net points, that player had a negative impact on the game. For the most accurate view, this should always be viewed in the context of Net Points and Individual Points Produced. Final Note - The total points produced and the total net points added will not always add up to the actual final tally of points and win margin. That's because basketball is a team game and the "team" has to get credit for some of these results too. In the game, Lazar had box score statistics of 18 points on 6-12 shooting (3-5 from three, 3-6 on FT). He had 11 rebounds (3 offensive), one foul, one turnover, and two steals. I'm not picking on Cubillan... he just had the lowest net points score from this game. In the game, David had zero points on 0-1 shooting (0-1 from three), with one assist, one turnover, and one steal. That's the view for how we determine individual player ratings. Most of our detailed graphs and charts on players reference a player's trends on ORtg, DRtg, and Net Points. We'll go ahead and place these articles on the front page so that they can also be referenced in the future. Now, let's get ready for the next game. Post-season Numbers - Where are my turnovers? 1980 ..... remember way back when?